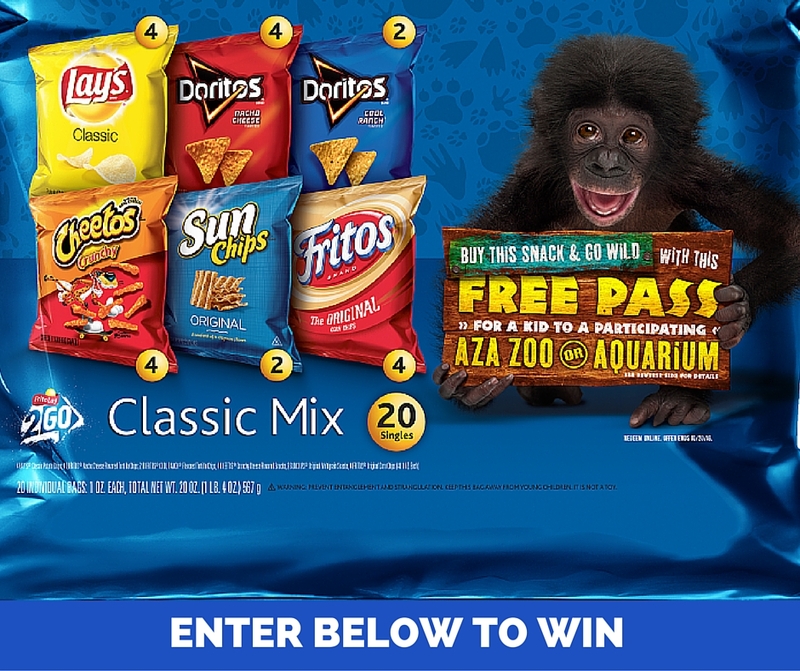 To spread the word about the Frito-Lay FL2Go promotion to get a free kids zoo or aquarium ticket through 10/20/16 with purchase of specially-marked packages, MommyBlogExpert is excited to be hosting this giveaway of the brand's Frito-Lay FL2Go 20-count snack pack. Until 8/22/16, enter below via the Rafflecopter entry blank for a chance to win this delicious prize, perfect for packing in kids' lunches or eating on the go. And don't forget to bookmark this page NOW and come back DAILY to increase your chances of winning this great prize! MommyBlogExpert's Frito-Lay FL2GO Snack Pack Giveaway includes the 20-count package pictured and ends August 22, 2016 at 12 am PT and is open to legal residents of the U.S. only. ONE (1) winner will be selected randomly and notified via email and must respond within 24 hours to claim their prize. FTC Disclosure: MommyBlogExpert did not receive any compensation in association with this post and Frito-Lay is providing the prize for the giveaway and is responsible for shipping directly to winner. See complete FTC Disclosure that appears at the bottom of MBE's home page and at the bottom of every individual post including this one. Doritos are my all time favorites. My favorite are Sun Chips. Cheetos are always my #1 choice! I love Fritos amd Cheetos. Oh I have to say I love the Fritos! I like Cool Ranch Doritos. Cheetos would have to be my favorite. My favorite is Cheetos- the crunchy ones. So good! Love the cheetos and fritos! cool ranch doritos are my favorite with some spinach dip! I love Lays Classic Potato Chips most of all! Wouldn't refuse Doritos either, though! They're all great! I love sun chips! They are so good! CONGRATS @jenrodrigues WINNER of MBE's Frito-Lay FL2Go Snack Pack Giveaway!